Fast forward a month, and several of my Legal Eagle colleagues were wondering if I had gathered any additional details given my penchant for graphs, tables and other data. After talking with about a dozen folks about their own grades/ranks, I tweaked the class rank chart to what you see here. I also added in my estimate of how many people fell below NCCU Law’s strict-C threshold and got academically dismissed at the end of the semester. It’s a very rough guess on my end, basically just taking the number of people I know personally who didn’t make it multiplied by the number of sections, taking a multi-year average of our historical 1L attrition data minus the folks who had already dropped, then weighting each of those two separate numbers and adding them together. I have -0- confidence that it’s an accurate count but I’m reasonably sure I’m ±5, so I included it anyway for informational purposes. 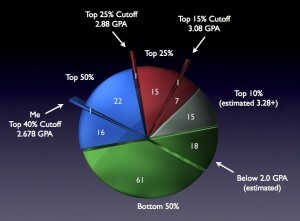 In the unlikely-but-possible scenario that my guess is a close approximation to the actual number of folks who will be gone, the attrition data highlights the challenge those of us in the middle of the pack academically are going to have trying to improve our class ranks this upcoming year. For example, being 62 of 157 puts me at the 40% mark now, but starting next week I’ll be 62 of ~139 (or less) — instantly dropping me down to 45%. It’s definitely a steep hill to climb. I rank 62 out of 157 1Ls. 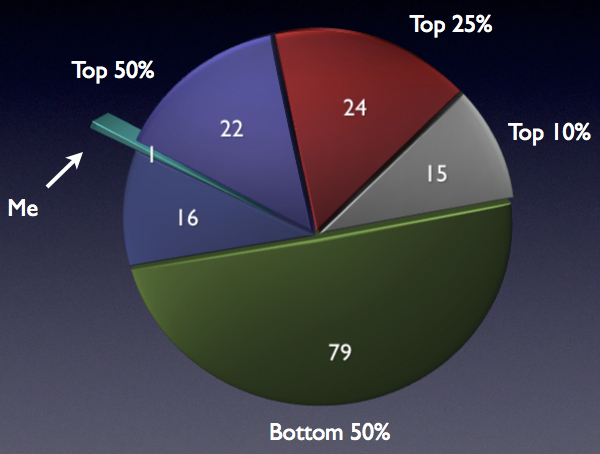 That puts me at a hair’s breadth inside the top 40%. The chart to the right shows where I’m at, though not much else. I’m not sure if the registrar will be allowed to provide us with the GPA cutoffs for a given percentile, or how many of those in the bottom 50% are folks going home for not making above a 2.0 — if I can get that info I’ll update the chart to something more meaningful. I did notice that if we were at 157 1Ls in April (I think this # excludes the evening students), that means we had already lost 12 of the 169 folks who started in the day program back in August. My assumption is that we’ll lose about 20 more students due to the GPA cutoff, putting our cumulative 1L attrition near the historical 20%ish mark. That’s all just speculation though. One year and a strict-C curve later, and I’ve vaulted from the bottom quartile to just short of the top third with a mere +0.066 change in GPA. Heading to bed so I can get up early for some hearings tomorrow — observing and/or co-mediating a pair of Medicaid appeal cases from the NC Office of Administrative Hearings ::joy:: Have a great night y’all! Several of my classmates at NCCU Law are expecting tonight’s entry to contain remarks on race relations and my Race & the Law class. Several of my UNCASG colleagues are expecting tonight’s entry to discuss a letter I wrote to the Raleigh News & Observer on the budget cuts proposed to North Carolina’s public universities. And several of my regular law:/dev/null readers are expecting more $$$-related tips. Final exams for the 1L Spring semester wrapped up on May 3rd. In other words: over a month ago. Now MDG has always been on-point with grading, so we got our CivPro grades over 2 weeks ago — making §103 the first section of 1Ls to get any grades at all. And based on what fellow bloggers have told me, taking over a month to grade 1L exams seems to be a common trait of law schools across the country so I think I’ve been fairly patient. And even though we weren’t given any official timeline from the registrar for when our grades would show up, Professor CrimLaw provided some insight when I asked… mentioning that June 7 was the deadline for professors to submit grades, and giving us a specific date when we’d no longer be in post-1L-but-not-quite-2L limbo. I love my law school. And I’m a big fan of all of my teachers. Do better, professors. Do better. Sorry to put y’all through that, I’m just mildly stressed out that 2 of my missing grades are in my 2 worst classes (Contracts and Legal Research)… and out of the grades I’ve gotten, I’m underperforming my predictions At this point I don’t even care about my precise GPA so much as I am wondering if I’ll have to repeat anything next year. It’s official folks: TDot is a 2L! The Civil Procedure II exam earlier today wasn’t my best work — unmitigated disaster would be a better description — but the only part that matters is that it’s OVER! As of 12:05pm-ish I’ve successfully made it through a third of my legal education. Way back in July after finally wrapping up my undergrad work at NC State, I was driving back to Virginia Beach to see Nan & Pops and was having a conversation with a colleague of mine who I’ll leave nameless. She expressed her “worry” over my choice to attend NCCU Law. Specifically, she seemed to think I was going to wash out within the first year. Back when I was a kid, I had the hardest time falling asleep on Christmas Eve knowing that in only a few short hours there would hopefully be presents under the tree, or at the very least — and often more highly prized — a bunch of candy in a stocking. When I got a bit older, and especially when I moved out on my own, the whole giving and receiving of gifts thing took a back seat to spending time with loved ones… and cooking a doggone tasty dinner So I found myself having a hard time sleeping on the eve of Christmas Eve instead, with the wide variety of work and festivities moments away. Tomorrow starts the last round of studying for Civil Procedure II, the last exam on the 1L docket at the NCCU School of Law. Then Monday morning at 9am is the exam, and 3 hours after that… freedom I’ll have to officially re-title law:/dev/null as “A 2L Blog”, and then get busy enjoying not having schoolwork to do. It took me just over an hour to work my way through 30 multiple choice questions, most of which were decided by me narrowing down to what seemed like two equally-plausible answers and just randomly guessing between them. I then spent the second hour trying to put together something competent on the essay, my response for which (I learned after consulting Madame Prosecutor post-exam) likely left out several chunks of analysis. Good luck to everyone still going through exams! And have a great night everybody! Sorry folks, no entry for tonight. The lack of sleep and less-than-stellar eating habits of exam time caught up to me yesterday. Body is currently engaged in all out warfare against a particularly vicious breed of germ of some kind. But speaking of exams, think I survived Property II this morning at least ::high fives all around:: Usually do poorly on the multiples but bang out the essay; this time it seemed flip-flopped. Will find out in a month or so. Final exams at NCCU Law started back on Saturday with Criminal Law I @ 9am. Most of my 1L colleagues seem to agree that it was a fairly easy exam since it was/is essentially an introductory course, compared to us being in the 2nd semester of all our other subjects. So it’s fair to say the real home stretch for the semester starts this coming week. Day off tomorrow to study, Property II @ 9am Tuesday, day off, Contracts II @ 9am Thursday, day off, Torts II @ 2pm Saturday, day off, then Civil Procedure II @ 9am the following Monday. So it’s the first last day of classes of my law school career. Now there’s a brief 2-day reprieve for “reading days,” then CrimLaw exam at 9am this Saturday. GOOD LUCK to everyone out there with exams coming up! I forced myself to stay at NCCU Law today despite the final exam tension. And I successfully sat (relatively) still for a whopping 4 hours doing actual school-related work. Wonder what will happen if this turns into a habit over the next few days?